everyone i have ever known that grows zucchinis in california has the same story to tell. the first crop is delightful...delicious...a joy..and zucchini pops up on the menu for many meals in a row. then, this prolific vegetable produces and produces and produces...and zucchini is added to every dish imaginable..family and friends go from loving the bounty to raising their hands in a desperate cry to MAKE IT STOP! !...but no relief..more and more and more. soon, every person you have ever met, along with every food bank in your town has been given some of your harvest and still..more squash. sometimes, you just need ideas for new and different ways to prepare zucchini. my friend deb over at the martha stewart, everyday food website, along with the folks at the away to garden site, is hosting a blog-a-thon on cucumbers and zucchinis.. at this time of year you just gotta...and then repeating the event with a new item every thursday between now and labor day.. it works like this..food and garden bloggers post stories regarding the week's topic..and ask readers to share their comments on the blogs..and check out all the other blogs on the same subject. ( as well as the two aforementioned sites)...this week's topic: "cukes and zukes, from tips for growing to how to take the bounty from garden (or farmer’s market!) to table." 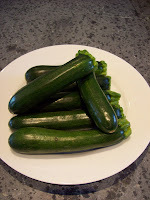 i love zucchini and find it is really easy to grow, so i am going to post some of my favorite..easy..recipes. please check them out and let me know what you think...also..and this is really important..please post your favorite zucchini..or cucumber..recipes in the comments section of my blog... readers from other blogs will be linked to this one..so the more recipes you share..and the more blogs you check out..the more zucchini and cucumber recipes we can all add to our collections..how cool is that? regular readers of this blog know that i am a broken record on the subject of quality ingredients..the following easy-breezy summer zucchini recipes use just a few ingredients..so it is important to use the freshest and best quality possible..try growing your own produce, or visit a local farmer's market..and keep your pantry stocked with the best extra virgin olive oil, "real" balsamic vinegar..organic sea salts, etc. ...you will not be disappointed...oh, and for those of you that have had problems growing zucchini..or anything else...check out the website away to garden... i have learned so much from margaret..you will too..and if you leave her a question in the comments section of one of her stories..her response time is remarkably fast..
preheat oven to 400 degrees. 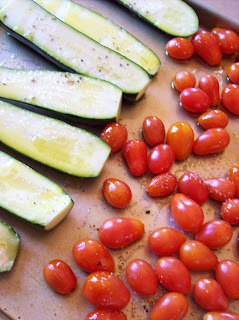 place zucchini and tomatoes on rimmed baking sheet. drizzle with olive oil and turn vegetables ensuring all sides are coated in oil. place zucchini cut side up. sprinkle with sea salt and pepper and roast in oven until tomatoes begin to collapse and zucchini is soft (knife pierces easily) and lightly browned. remove from oven and top zucchini with grated parmesan cheese. place back in oven and roast an additional 3-5 minutes until cheese has melted...watch carefully to ensure cheese does not burn. remove from oven and allow to cool slightly. drizzle each plate with balsamic reduction and top with 2 pieces of zucchini. divide tomatoes evenly between plates. drizzle a bit more really , really high quality extra virgin olive oil on top and sprinkle with basil and a bit more sea salt if needed. serve. 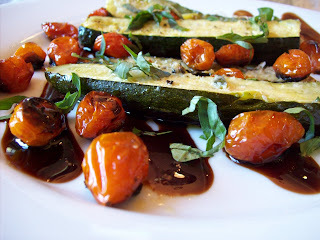 variation..substitute the balsamic with your favorite homemade tomato sauce. serve with freshly grilled bruschetta rubbed with a clove of fresh garlic and extra virgin olive oil. stir together the potatoes, zucchini, onion, parsley, salt and pepper in a large bowl. heat the oil in a large skillet over medium heat. add the potato/zucchini mixture..spread out in the skillet to ensure the entire bottom is covered. cook until the mixture is nicely browned on the bottom. this should take about 6-8 minutes. 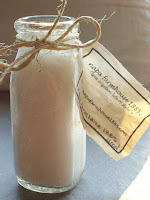 frequently press down on the mixture with a wooden spoon or spatula to help form a crust. run the spatula around the edges of the hash browns to loosen from the bottom of the pan. place a plate over the top of the mixture and flip over. add the hash browns back to the pan with the cooked side on top. cook until dark brown, about 5 minutes longer...watch carefully..do not brown. if desired, sprinkle cheese on top during the last few minutes and allow to melt.... cut into wedges and serve immediately. o.k. everyone..enjoy the zucchini dishes..and remember, please share your favorite zucchini and cucumber recipes in the comments section..the other readers..and i..appreciate it in advance...or feel free to request a recipe..we will try to accommodate..
do you like punt e mes? happy friday afternoon everyone! at least it is friday as i write this...it is a beautiful, warm day here in napa..has been a very long week..and i have decided that it is the perfect time for a cocktail. my twitter friend, sandy gluck, editor from martha stewart's everyday food magazine, posted last week that her favorite at home cocktail was punt e mes on ice with a squeeze of lemon. i confess that i had completely forgotten about punt e mes..had not had it in years..and as soon as i read her twitter message i went out to buy a bottle. i have been talking about it all week and have not found anyone who has ever heard of it..so i have been encouraging everyone i know to give it a try..thought i would do the same for all of you...if you are a punt e mes fan please share your stories and recipes in the comments section...for everyone else...if you are unfamiliar with this beverage let me provide a bit of history. so a quick (at least for me) story. i really wanted to see the new movie mama mia. my husband is one of those people that hates musicals in movie form. he is o.k. with most stage plays..but a musical movie..no way.. i asked my friend shesh to go with me..she adores musicals..and we went tuesday night... i was feeling fine during the movie..but we decided to grab a quick dinner afterwards and..as soon as we sat down..i began getting a headache...it quickly turned into a migraine. i literally threw some money at shesh to pay for my portion..left my mostly untouched entree..and drove home. happily, i live 5 minutes from the restaurant...by the time i got home..massive migraine had set in..the works..weird light in my left eye, horrible pounding head, queasy stomach...and major sensitivity to noise and light... i pulled the blinds..turned off all lights..got in bed and pretty much passed out. the next day the headache was mostly gone..but i still felt groggy and a bit queasy. tried to ignore it..even went to the gym..no luck..finally, my husband suggested an afternoon punt e mes cocktail..we both remembered that it is sometimes used to settle upset stomachs..well, it worked like a charm..felt 100% better after 2 sips...must be the herbs?..but in any case..what a benefit!..oh yeah..and my husband has been rubbing it in all week that i left home to see mama mia..and returned with a massive migraine...i promise..really, really, promise..one had nothing to do with the other...but he is getting a lot of mileage from this. anyway, give punt e mes a try...and please let me know what you think..i think i will finish my cocktail now..enjoy your weekend everyone! 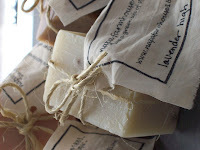 "live a green life of style"
when i started my business it was very important to me that i find ways to tell the stories of the artists and craftspeople producing our products....i hand select every item we sell and the design criteria needs to meet the following objectives..handmade using reused, repurposed, reimagined or recycled materials..or organic for food and body care..and they must be "hip, cool, eclectic, clean, simple, beautiful..and kinda groovy"... high standards..right? that is why i am so passionate about celebrating people who appreciate fine craftsmanship and deliver excellence in all that they do..whether they are chefs, painters, musicians, woodworkers, seamstresses, producers of quality organic food ingredients..you name it, to me the common thread is the work..especially in this mass -produced, disposable everything world. i spent some time last year around some businesspeople here in the napa valley that operate under what i think is a bit of a less than honest practice. they purchase products from others..and then market it under their brand name..i even learned the term..shiner...which is what it is called when you order food products and ask the manufacturer to leave off the labels so you can add your own. now, there is nothing wrong with this practice unless you give your customers the impression that you made it yourself...i think smart merchants know that telling the stories of the products and the makers of the items leads to a more interesting dialogue..and honesty in business and treating people fairly is always the best policy...so i decided to stop watching others..and start doing myself..which is what led to napa farmhouse 1885™ . i want to continue to find opportunities to recognize craftspeople..and to urge others to seek out individuals who create beautiful, handmade products. 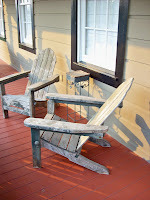 my goal is to tell the stories of many of the creators of artisanal foods, organic gardeners, artists, winemakers, chefs and designers here in napa...and... if you know of someone whose story must be told..feel free to email me..or post in the comments section of this blog ..and remember..the best stories are those that are passed on. first i should say that i love avocados..pretty much in any form. when i was a kid, my aunt lena had a really big avocado tree in her back yard in southern california. 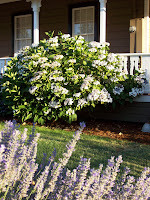 this tree produced massive amounts of avocados..my memory may be faulty..(ya think? )..but i seem to remember avocados year round. she used to give bushels of them away to everyone in the family..so i ate avocados all the time. it wasn't until i was older..and met people from outside of california..that i realized not everyone was familiar with them..many people i met had never even tried one..now, with the popularity of guacamole, most people know of avocados..but still have questions regarding their use..their fat content...and the on-going controversy of the world's best guacamole recipe...happily, we now know that the fat in an avocado is the good fat, that they are full of fiber and vitamins..and that there are countless ways to use this fruit (yes, an avocado is a fruit although it is used more like a vegetable) ..
i still use avocados all the time..i will spread mashed avocado on toast with a sprinkling of sea salt and eat for lunch or as a snack..i slice and add to salads, omelets, taco topping..cut them in half and fill with tuna, chicken, shrimp, crab or lobster salad, add to sandwiches, make avocado salad dressing..avocado soup...hundreds of recipes. but..more than all of these options..i make guacamole. 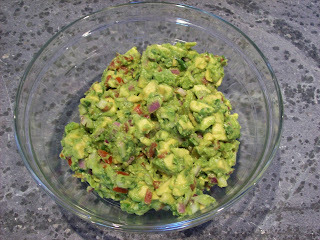 i must admit..i am pretty addicted to guacamole..and have tried many different recipes. i have found that people are pretty passionate about their guacamole recipes..and everyone thinks their version is best. i have my own favorite..but like to try different recipes too. my friend shesh came to dinner sunday and brought over a few avocados. she decided to make her guacamole..which is the simplest version i have ever tasted. she just mashed up the avocados..added a bit of cilantro, salt and pepper..and served...it was really good. the avocados were perfectly ripe, the cilantro had a bit of a bite and the flavor was really pure...we gobbled it up. 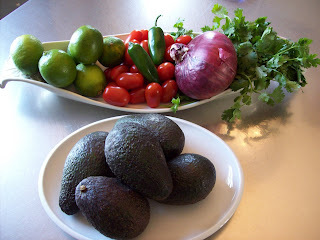 my version uses avocado, finely diced red onion, cilantro, freshly squeezed lime juice, sea salt and diced jalapeno. i don't really used a recipe..i just add the ingredients to taste... but i do ensure all the ingredients..including the avocado..stay chunky..i like texture in my guacamole.... for those of you that have never cut up an avocado..here is a classic..and my favorite..technique. cut the avocado in half lengthwise. there is a big seed in the middle so you will need to cut around it. the seed will stay in one of the halves. use a chef's knife to gently whack the center of the pit so that the knife is slightly embedded in the pit...don't whack too hard or you will cut through the pit...twist the knife, pull out the pit and discard. (note..for safety's sake, put a kitchen towel in the palm of your hand and place the avocado on the towel the first few times you try this technique...be careful!). 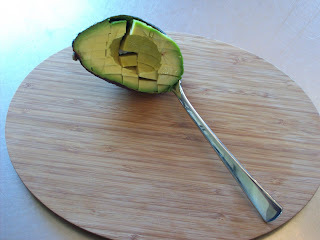 slice each half of avocado lengthwise into 1/8 to 1/4 inch strips, and then cut across forming a grid. 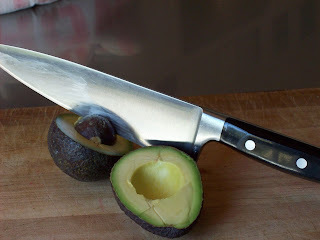 use a spoon to gently scoop out the avocado flesh. combine the diced avocado with the onion, cilantro, lime juice, sea salt and jalapeno. serve immediately...i finely dice all ingredients except for the avocado and keep a lot of texture in mine. a twitter friend @emilyolson reminded me of the guacamole at rosa mexicano...i have ordered guacamole at numerous restaurants throughout the united states and mexico...while i have had many really good versions the absolute best restaurant guacamole i have ever had was at rosa mexicano in manhattan. their guacamole is prepared tableside in a traditional molcajete, which is a mortar and pestle made from volcanic rock...i have included the rosa mexicano recipe to get you started.... if you have never made guacamole before...give it a try..it may become your favorite too...but don't be afraid to experiment with ingredients you like...i challenge you to create your own "signature guacamole recipe"...oh and since this requires salt and freshly squeezed limes..can you say "pitchers of margaritas"??!! 3. Scoop the diced avocado flesh into the molcajete. Repeat with remaining avocado halves. 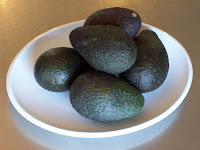 Gently fold the avocado into the chile–onion paste, keeping the avocado pieces fairly intact. 4. Add 3 tbsp. diced tomato, 2 firmly packed tbsp. chopped fresh cilantro, and 1 tbsp. finely chopped white onion. 5. Fold together all the ingredients. Taste and add salt, if necessary. 6. Serve immediately, directly from the molcajete (or bowl), with tortilla chips. we are having guacamole tacos for dinner with refried black beans, spanish rice, homemade green chile corn tortillas..and margaritas.. want some? 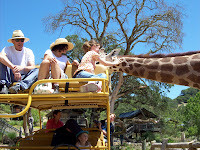 have you been to safari west? "In a world increasingly dominated by technology, instant communication and instant gratification, Safari West stands as a tangible testament to the joy of the natural world, where the pace of life is dictated not by deadlines, but by nature. Nestled on 400 acres in the heart of California's wine country, Safari West is home for over 400 exotic mammals and birds. Not a zoo, not a drive-through park, it's a wildlife preserve where the whole family can experience some of nature's most beautiful animals in a natural habitat. Established by Peter Lang in 1989, Safari West gained membership in the American Zoo and Aquarium Association, one of only six private facilities in North America to belong to that prestigious organization. The ongoing mission of Safari West is wildlife preservation through breeding, education, research and public interaction. What happens at Safari West? The propagation of endangered species. 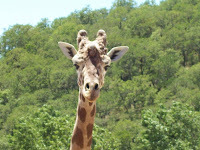 Safari West is the home of zebras, giraffes, cheetahs and many more exotic creatures. Under the directorship of Nancy Lang, Safari West is breeding several endangered bird species. Conservation programs are in place for two species of Saharan Desert antelope now extinct in the wild. But Safari West is more than a preserve. We are dedicated to raising awareness of our exotic neighbors and promoting understanding through in-person contact. That's why we offer safaris year-round. If your only experience with a zebra or giraffe has been at a zoo, you should see these beautiful animals in their natural habitat. You owe it to yourself, and to them. ""It is not often that a person's vocation matches his passion. But, when it does...the result is excellent." 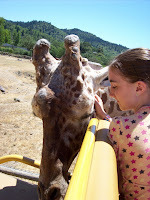 "
i must agree...safari west is excellent. imagine 400 pristine acres in the napa valley...with wild animals allowed to live as if they were in their native habitat..no cages...no bars...no unnatural performance training...now picture being able to experience this up close and personal. i have never been fortunate enough to go on safari in africa...but i think this runs a close second. when you go, you spend part of your time on a walking tour..but most of the time is spent bouncing around in a two level jeep traveling those 400 acres. the prime spot is the 4 person seating on the jeep's roof...you rotate your seating throughout the tour so that everyone can experience the "upper deck"..we were fortunate on our tour..there was only one other family on the jeep..so we each got to spend half the time upstairs...it was a gorgeous day..warm, blue skies...and you could see for miles up there.. the highlight of the trip for us was passing the giraffes' habitat..and having one of the giraffes come right up next to allie... the tour guide said she could pet his head..oh my...have you ever been that close to a giraffe? they are even bigger than you think...and have you ever seen a giraffe's tongue? way, way bigger, wider, longer..and slimier than you can imagine..
safari west also has antelopes, gazelles, lemurs, zebras, cheetahs, wildebeests, nyalas, african cows...over 100 different species of mammals native to africa.. what an experience... but i must tell you my favorite story of that day. the guide was telling us about the safari west wildlife foundation..and their mission to educate the local community through seminars, workshops, wildlife camps for children and more...so that we all develop a deeper appreciation for the animals and continue to understand the importance of conserving/preserving nature and the planet. our guide was telling us that one thing they are trying to do is raise enough capital to put the wildlife preserve into a trust so that it can never be sold to developers..can you imagine how attractive 400 pristine acres in the napa valley would be? allie looked at him and said.."if that happens, what happens to the animals?" she then looked at us and said, "we can't let that happen..i have $35.00 that i saved up for my vacation to spend in napa..i was going to buy some shoes..can i give them the money instead?" 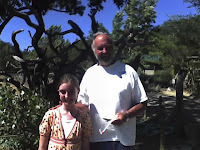 how cool is that?..a ten year old so touched that she wanted to donate her vacation money...we told her that of course it would be o.k...the guide was so moved that he radioed for peter lang, the founder, ceo and president of safari west to meet us when our tour ended...the following photo shows peter and allie..with peter holding allie's envelope of money. he was extremely gracious and told us that a donation like that meant a lot more to him than massive amounts from major donors..because it was given from the heart of a 10 yr old who "got it"..and understood what they were trying to accomplish. i live in napa..it is crazy that i had never been to safari west before..i will be back..and will work to support their mission. if you live in napa..please go..if you visit napa..please add this to your itinerary..i promise you will not be disappointed. 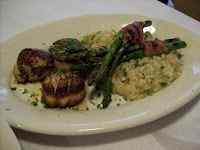 in the interim..please check out their website safari west for more information..
have you been to uva trattoria & bar? in downtown napa? uva is one of those places that makes you feel comfortable, happy and relaxed...sounds like an odd description for a restaurant doesn't it? what about the food? here is what i mean..the food is really, really good, the service..knowledgeable and friendly...the bar..terrific..they have live jazz wednesday through sunday..and there is a good mix of locals and tourists...many tourists i have talked to have commented that they enjoy feeling "like they belong here"..or "this is what it must be like to live here"...uva is that kind of place. 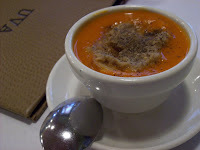 oh..and the chef/owner is giovanni guerrera...giovanni..if you happen to read this..and want to share any of the recipes in the comments section..we would be very, very happy. antipasto-flash fried squash blossoms stuffed w/teleme cheese w/zucchini relish and tomato sauce. 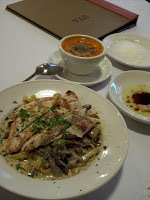 pasta-spinach tagliatelle w/grilled portobello mushrooms, roasted tomatoes, toasted garlic, pecorino romano. pesce-alaskan halibut w/brentwood sweet corn & morel mushrooms, garlic whipped potatoes, zucchini salad garnish. carne-5-dot ranch skirt steak w/roasted shallot sauce, flash fried fingerling potatoes, torpedo onions, broccolini, gorgonzola aioli. pizza-fontina cheese, fresh mozzarella, mushrooms, arugula.